Revlon Super Lustrous Lipstick in Pink Cognito+Bobbi Brown Lipgloss in Pink Sugar* (limited edition), similar here-I have to mention these products side by side because combined they work so well together. There's not much more to say about these really. They're the perfect 'my lips but better' combination and aren't drying in the slightest. Eyeko Eye Do Mascara-Eyeko are on to a good thing when it comes to their mascaras and eyeliners, and this mascara is amazing. I have quite long lashes already and sometimes mascaras just make them look straight with no curl in sight. Eye Do gives length and holds a curl, perfect for sixties style lashes. It has an unusual helter skelter-esque wand, but it coats every single lash, even the pesky inner corner ones. I've tried a few mascaras in my time and this may well be my all time favourite. 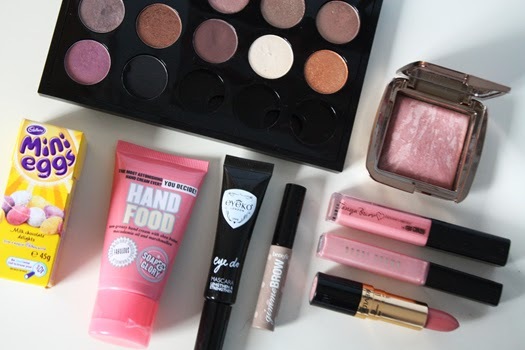 Soap and Glory Hand Food-Do you want silky smooth hands without having to use a thick, greasy hand cream? You need to try Hand Food then. Its marshmallow scent is sweet, but not overpowering, and the shea butter and macadamia oil leave your hands feeling moisturised and in tip-top condition. If you're in Australia and passing by Mecca Maxima then you need to add this to your basket. Cadbury Mini Eggs-If you haven't tried Mini Eggs then you have not lived. Cadbury only bring these out at Easter and they're basically bite sized easter eggs coated in a candy, pastel hued shell. They're delicious and dangerously addictive. Love. Miranda Sings-I am very, very late on the Miranda Sings bandwagon, given her channel's been around since 2008. This month though I have loved her videos. Yes, they're a little bit silly but they're entertaining. Her videos with Joey Graceffa and Grace Helbig are hilarious. If you're having a bad day then give some Miranda videos a watch. Her creator, Colleen's channel is worth the watch and subscribe as well. *What have you been loving in March? You'll definitely have to! If you're in the city The Warehouse has them :). Where did you buy the Hourglass from? It's so expensive here in NZ. Thanks for sharing your March Faves. Hi Karen. You can buy Hourglass products from Mecca Cosmetica in New Zealand. Your mac palette looks so lovely :) I just started mine last week! Very glad you are a new Miranda convert ;-) She is the greatest. I would do a "Miranda face" in every show of Mamma Mia, in the bit where they "take the photo" at the wedding, hehehe!